On February 21, 2019, State Councilor and Foreign Minister Wang Yi and Foreign Minister Chingiz Aidarbekov of Kyrgyzstan jointly met the press after their talks in Beijing. Wang Yi expressed that it is Foreign Minister Chingiz Aidarbekov's first visit to China, and Foreign Minister Chingiz Aidarbekov is also the first foreign minister from Eurasian countries that the Chinese side received this year, which fully demonstrates the close relations between China and Kyrgyzstan as well as between China and countries in the Central Asia. We have just reached many important consensuses on how to advance China-Kyrgyzstan mutually beneficial cooperation, especially to enhance mutual trust and support respective core interests as well as on other issues. We agreed that since the establishment of diplomatic relations between the two countries 27 years ago, China-Kyrgyzstan relations have maintained a sound development momentum, with cooperation in various fields yielding fruitful results and traditional friendship being increasingly consolidated. Last year, President Sooronbay Jeenbekov successfully made his first state visit to China, during which President Xi Jinping and President Sooronbay Jeenbekov jointly announced the establishment of China-Kyrgyzstan comprehensive strategic partnership, ushering in a new era of friendly cooperation between the two countries. 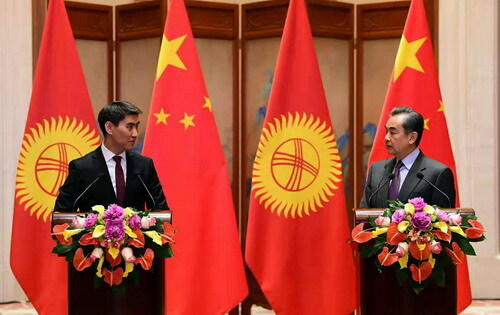 Both sides agreed to continue to deepen mutually beneficial cooperation in various fields and elevate China-Kyrgyzstan comprehensive strategic partnership to a new level in accordance with the grand blueprint drawn by the two heads of state. First, both sides should constantly enhance political mutual trust, eliminate any external instigation and interference, continue to firmly support each other on issues concerning respective core interests and concerns, cherish and maintain bilateral friendship, as well as safeguard and expand common interests under the guidance of head-of-state diplomacy. Second, both sides should take the joint construction of the Belt and Road Initiative as the mainline, enhance the integration of development strategies of both countries, focus on key areas of cooperation including economy and trade, connectivity and production capacity, and forge new cooperation highlights. Kyrgyzstan is one of the first countries to support and actively participate in the construction of the Belt and Road Initiative. The Chinese side welcomes President Sooronbay Jeenbekov to attend the second Belt and Road Forum for International Cooperation in China this April to discuss the undertakings of cooperation. Third, both sides should deepen security cooperation and maintain common security. China and Kyrgyzstan are neighboring countries facing common security concerns and real threats, and share weal and woe on regional security issues. We make a commitment to mutual assistance and strengthening cooperation in such aspects as fighting against the "three forces", drug trafficking and transnational organized crime, in a bid to jointly safeguard security and stability in both countries and the region. Fourth, both sides should expand people-to-people and cultural exchanges and carry forward traditional friendship. The two sides will continue to carry out colorful exchange activities and propel exchanges of literature, academic circles, journalism, and youth groups to further promote people-to-people bonds and further consolidate the public opinion foundation of China-Kyrgyzstan everlasting friendship. Fifth, both sides should strengthen coordination in international and regional affairs. As the rotating presidency of the Shanghai Cooperation Organization (SCO), Kyrgyzstan will host the 19th Meeting of the Council of Heads of Member States of the SCO this June. The Chinese side is willing to fully support and coordinate with the Kyrgyz side to well do relevant work and promote the SCO to realize new development on the basis of the Qingdao Summit held last year.